Welcome to Disneyland in 1963! We’ve got two super ’63 items in today’s post. 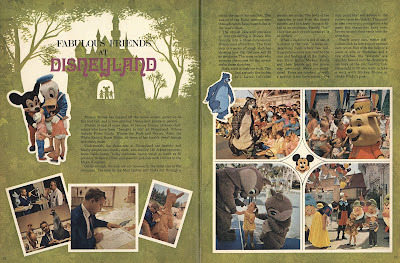 This “Welcome to Disneyland” brochure came in a few different varieties, I’ve got a blue one (’62?) somewhere. 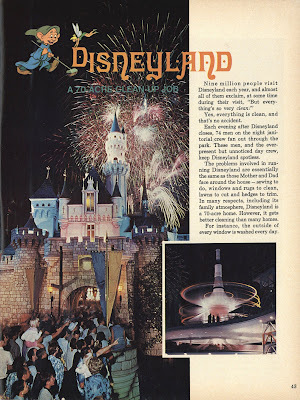 Fun drawings on the front and that’s a pretty big flying saucer there in Tomorrowland. 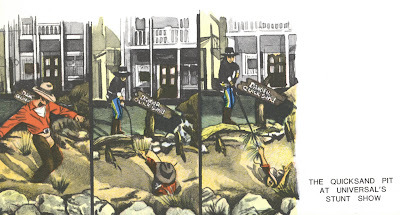 Don’t those Main Street exhibits look neat? 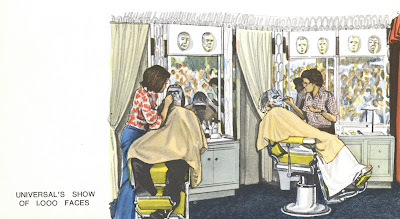 Are there interior photos of the Yale & Towne shop out there? Daveland has an amazing animated version of this map on his website (link) I can watch that thing all day. 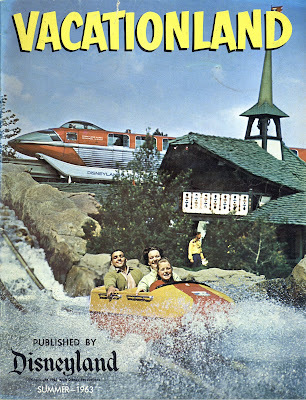 Here's a classic issue of Vacationland – Summer 1963. Its 24 pages are jam packed with great articles. 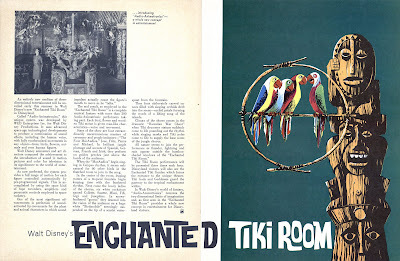 Ambassador of Happiness; Disneyland’s Summer Spectacular; Walt Disney’s Enchanted Tiki Room; What’s New in “Fun” with the Movieland Wax Museum; A to Z at Disneyland; Dateline Disneyland and more! The non-color paper hasn’t held up so well over the years, but the color paper is looking great, I love that original artwork. Look who I found! Andre Tahon with Papotin’s Revue (link). Yes more fun with the quizzical, mop-haired marionette named Papotin. And for Major, Mr. Tahon prefers to call his puppets “marottes”. Personally I think Andre’s puppets belong in the Trilogy of Terror. 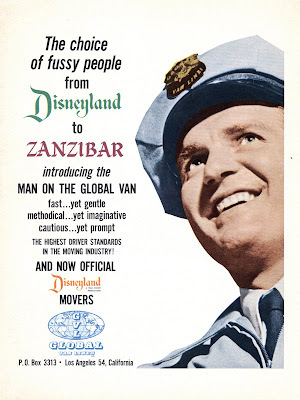 “From Disneyland to Zanzibar” sounds like a great movie title. Come back tomorrow for a mini trip report. Please tell me this just happened and it's already fixed [hide small children] (link). 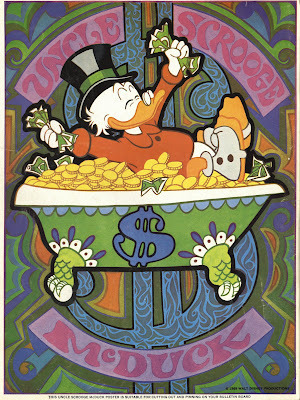 Here’s a fun look back at the good old days of Disneyland Tickets. 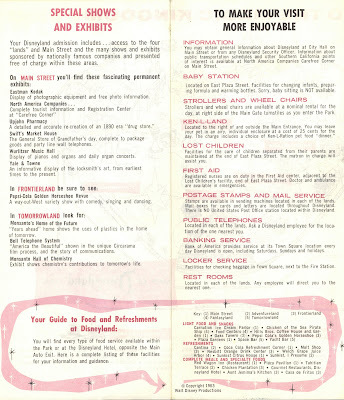 From January 24, 1964, this price sheet has all the details you’ll need to purchase tickets. What great choices; Guided Tours, 10 and 15 Adventure Books and General Admission tickets. It’s interesting to note that children under three are admitted free to all rides and attractions except the Carrousel, Pack Mules and Midget Autopia. 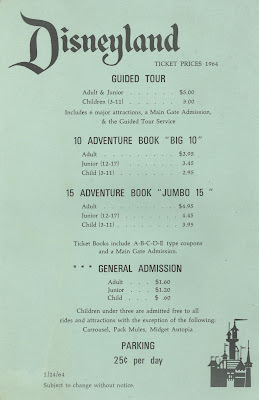 Check out my previous post of a different price sheet from April 1964 (link). There's no mention of the "children exceptions" in the other price sheet. Did Disneyland retract that exception after a few months? 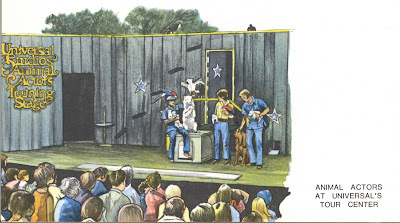 Wish me some “Crowd Magic” today, I’m making an early visit to the park! 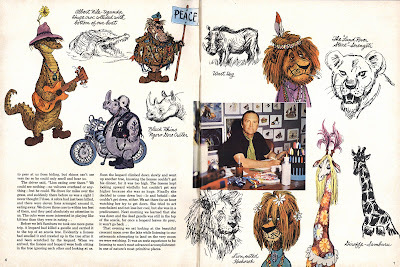 From a reference in Al Lutz's latest column over at Miceage (link), here is an amazing audio clip of Walt Disney from 1965. Its just 10 minutes long, listen to it when you have a quiet moment. I've heard and seen lots of Walt stuff, but this has a special warm feeling to it, made my day. Here’s a silly little item I just happen to think is really cool. A simple note pad souvenir from Universal Studios. 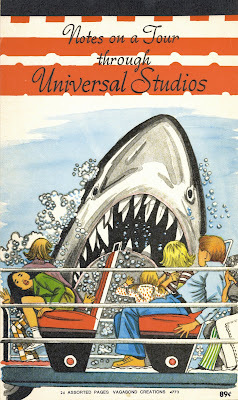 Undated, but since jaws is featured I’d place this at 1975/76. The 24 assorted pages are really six different assortments four times! Anyway, here are the six different pages by Vagabond Creations. We went to see Jaws the summer it opened at Universal, somewhere around here I have a super8 film I took of the event, gotta look for that. 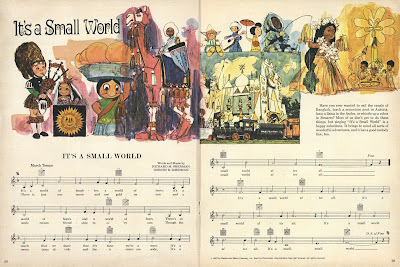 For today’s post I’m pretending I’m a real vintage slide blogger by presenting some vintage Disneyland slides. These slides (Processed January 1960) are on “Arizona” film", film that turned somewhat dark and murky over 59 years. My scanner saw them as dark smudges so I enlisted Daveland for some help. Thank you Dave! Now we can see these and the look great! Is that Vesey Walker leading the band? 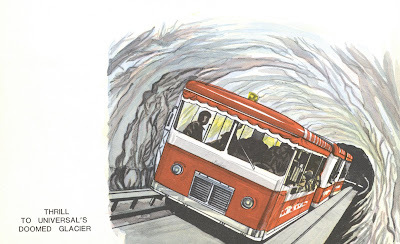 Where’s all the cables sprouting out of the top of the Matterhorn? Things are “In Motion” over at Tomorrowland. Who else misses the Speed Ramps? Fantasyland with lots of trees! You can see the "behind the scenes" area in the Pre-waterfall photo. The Columbia has set sail on the river. Is that spot on the right side of the river bank the area that would become Cascade Peak? Who else misses Cascade Peak???? Not the most flattering shot taken on deck, but the red feathered hat is nice and centered. Welcome to Magazine Monday. 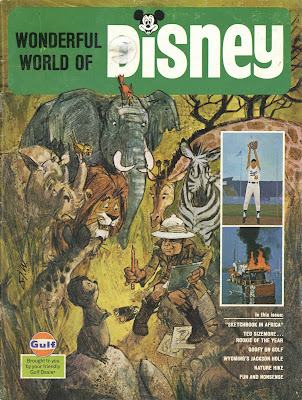 Today is “Three for One” day, three issues of “Wonderful World of Disney” Magazine, brought to you by your friendly Gulf dealer. 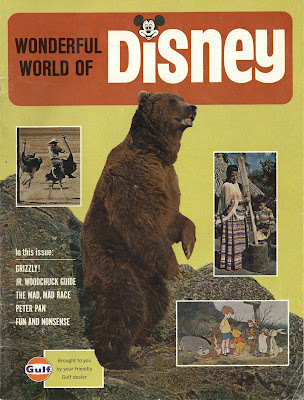 There were so many different “Disney” magazines it’s hard to keep track! Up first from early 1969 its issue 2 of Volume I. These are certainly “Kids” magazines, with lots of puzzles and easy to ready articles. “Fabulous Friends at Disneyland”. A fun look at the characters that walk around the park. 120 degrees in side those costumes, whoa! It’s interesting how this article takes a peak behind the “magic”, it even shows one of the costumes zipper!! Each issue has a “Monster of the Month”, this month we’ve got one groovy looking troll. 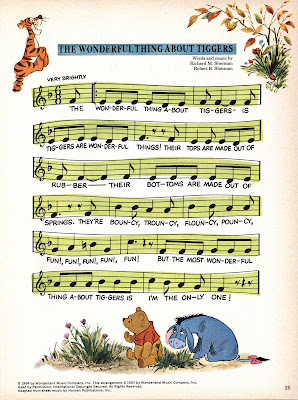 There is also sheet music in each issue, anyone know this tune? ttfn..
And the back covers have some far out artwork as well. 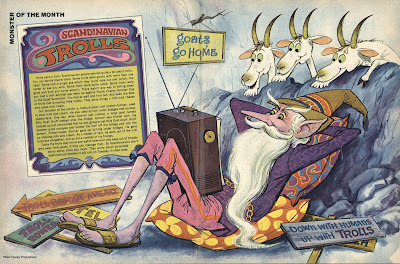 Next from the Spring of 1969, its issue 3 of Volume I. The space program is front and center with long six page article, which surprisingly is kind of boring and focused on the Gemini program? If anyone wants to see it on bonus Sunday let me know, I take requests. 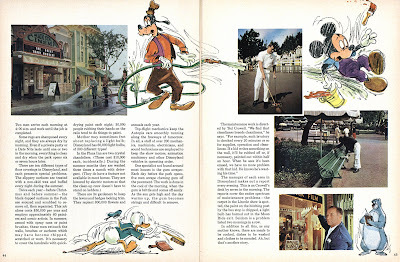 “Disneyland, a 70-acre clean up job”. An interesting article on the major clean up each night at the park. Did you know there are ten different types of floor coverings at Disneyland? 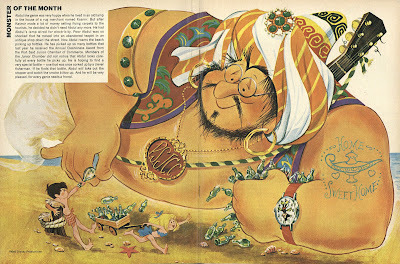 This month the “Monster of the Month” is Abdul the Genie. Odd little story. Hey I think I might know this tune. 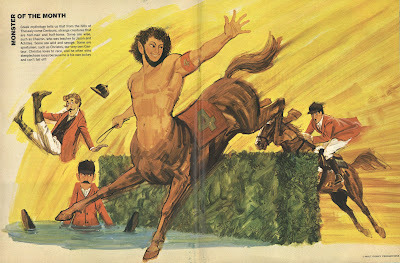 More groovy artwork for the back cover. 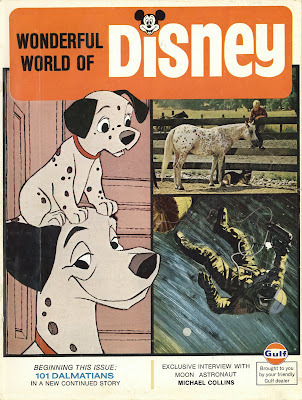 The last issue for today is from January 1970, issue 1 of Volume II. 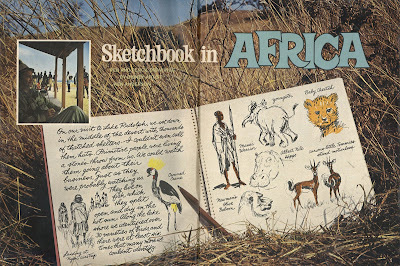 The cover is a drawing by Disney artist Ken Anderson from the featured article “Sketchbook in Africa”. 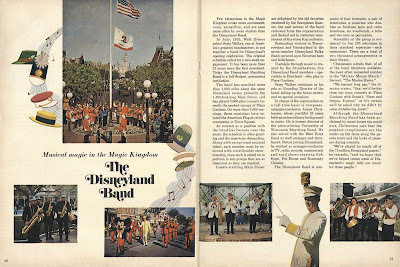 “The Disneyland Band”. 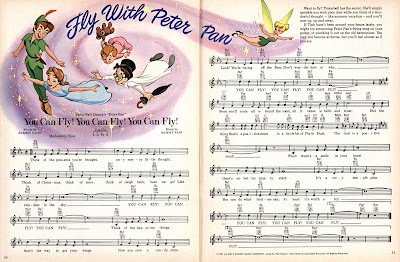 Lot’s of information about the makeup of the band, Vesey Walker (Founding Director) and composer-arranger-conductor James Christensen. 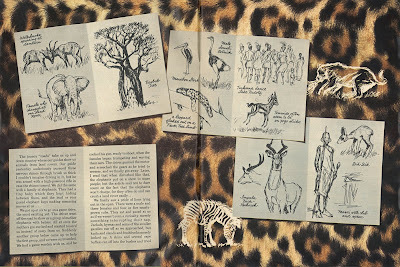 Here’s a great 6 page article “Sketchbook in Africa” by Ken Anderson. I am totally digging all these fun animals. The crocodile looks like he belongs in America Sings! 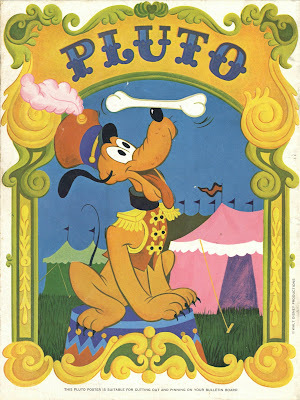 Pluto Says “Good Bye and thanks for joining us on Magazine Monday”. 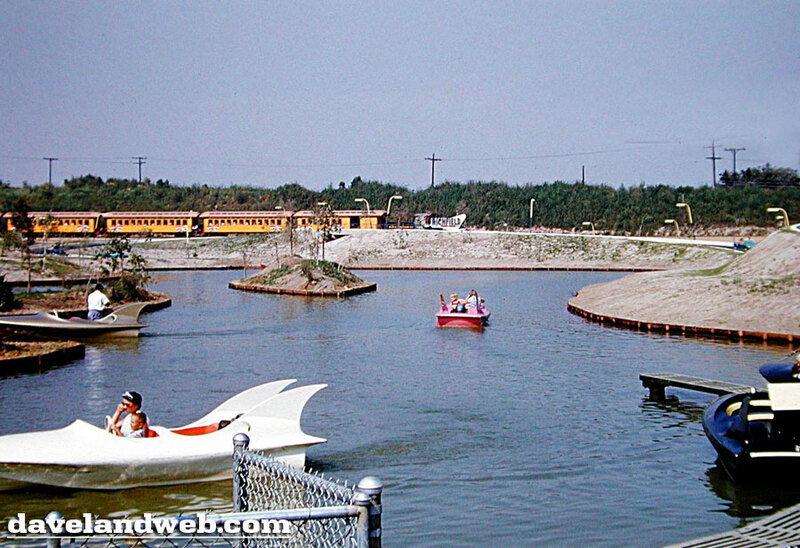 Here's a fun shot of Disneyland's rare Phantom Boats. I know they had problems with these and they didn't last very long at the park, but boy do they look cool or what? 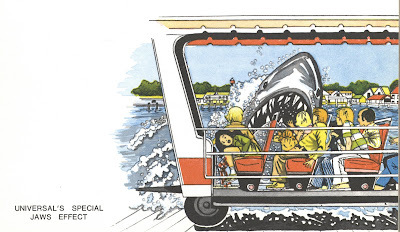 Could you imagine blazing down the Colorado River today in one of these, I bet you'd get some odd looks! This photo appears to be from when Disneyland had a cast member do the driving. 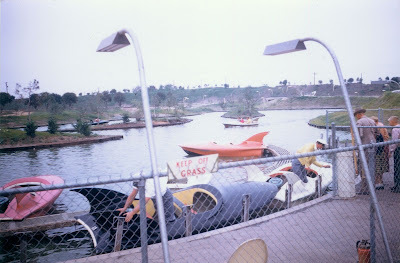 If you check out this photo (link) from Daveland, you can see there are no cast members driving. In fact, Dave's photo shows a steering wheel in the front seat and today's photo clearly shows there is no steering wheel up front? Did they removed the front steering wheel or add it later? I'm thinking the removed it after too many guest "incidents"... Either way they're cool and I want one! 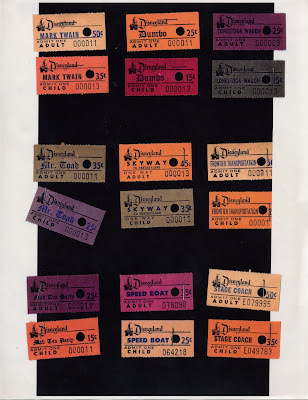 The old "Stub Style" tickets have the boats referred to as: "Speed Boat", was this from the first naming of the ride "Tomorrowland Speed Boats" or did they just simplify the names on the tickets? Do you need help finding Disneyland? 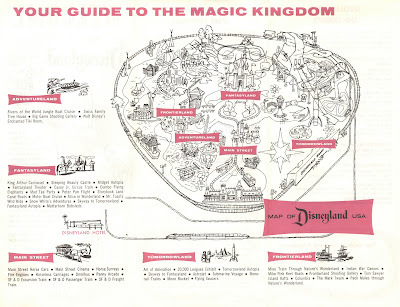 How about using this handy “Official Disneyland Road Map”. Courtesy of your friendly Richfield dealer. 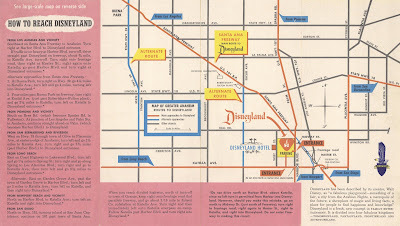 This map doesn’t have a date, but must be from 1955 as it mentions the fabulous “new” Disneyland Hotel. 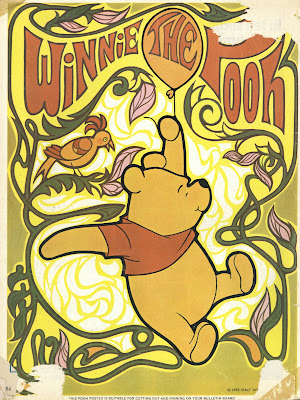 I can never get enough of the early Disneyland artwork. Be sure to visit Richfield at Disneyland. The Autopia cars run on the New Richfield Ethyl. 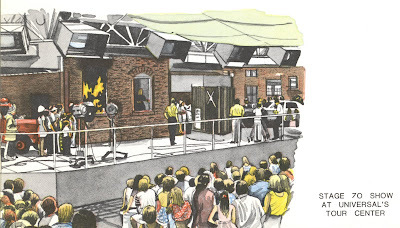 Is Richfield’s “Years-Ahead Show near Autopia” the same thing a “The World Beneath Us”? Motoring Tip! Always fill up with Richfield Ethyl! 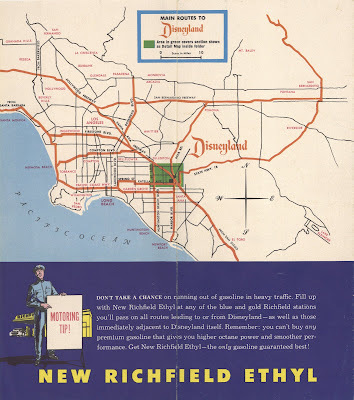 It's neat how Richfield had a service station “immediately adjacent to Disneyland”, more excellent corporate sponsorship. There’s a lot to look at here in the close-up section. I see a Katella Gate Entrance in 1955 (link) and mention to use the Katella Gate Entrance should you head north on Harbor by mistake.